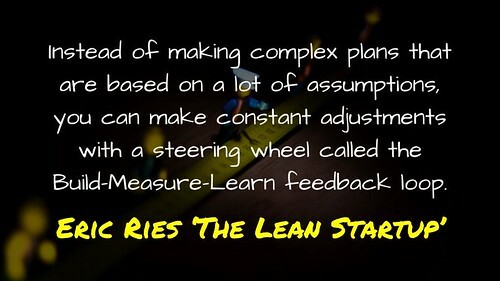 Starting with a vision linked to a hypothesis, the lean focus is on the build-measure-learn feedback loop. This is about learning at each step along the way and making adjustments accordingly. Whether it be Jackie Gerstein’s iterative process, Gary Stager and Sylvia Libow Martinez’ idea of think-make-improve or Alma Harris and Michelle Jones’ disciplined collaboration, each framework provides a structure for learning through a constant cycle of feedback and reflection. Providing his own take on this, Doug Belshaw has written about the possibilities of Kanban and Agile workflows for education, while Steve Brophy has reflected on the use of the Modern Learning Canvas to support innovation. 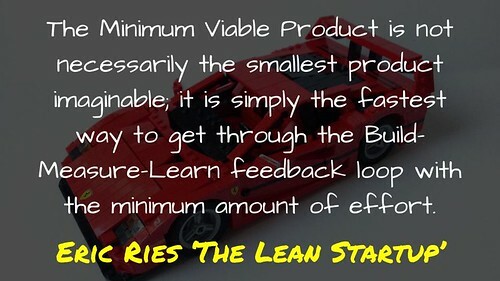 Rather than committing endless resources to an idea, the minimum viable product is designed to quickly develop an experiment in order to test out the riskiest assumptions. Yevgeniy (Jim) Brikman argues that the MVP is better considered as a process of gathering feedback, rather than the actual creation of a product. In education, this is significant as too often extensive resources are committed to a problem with little thought given to refining the initial hypothesis. For example, Richard Olsen suggests that before investing time and money into a new digital platform to increase writing results, get students to swap laptops in order to test whether collaboration makes a difference. This initial information can be used to develop a clearer picture of the problem. It is so easy to come up with an idea and forget who it is actually designed for. 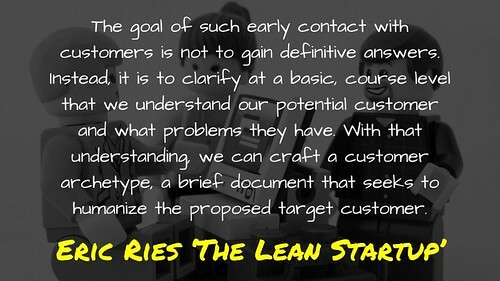 Although we may think that we know the customer or audience, it is important to be open to actively developing this understanding. In education, our customers are the students. Although it can be easy to be guided by the age expectations of curriculum documents, this often overlooks where students are actually at or what their interests may be. It is for this reason that simply rehashing old planners can be problematic. In a recent post, Corrie Barclay spoke about the importance of using data to identify what needs to be done. 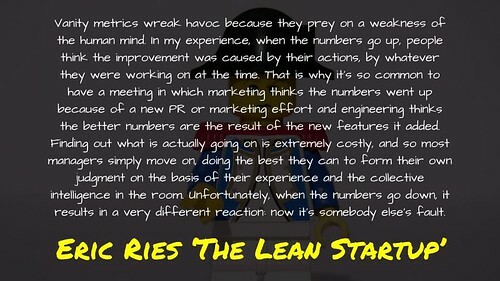 This is true, but the problem is that too often we measure what is easy or obvious, rather than what really matters. This can lead to confusion about what work we actually need to do. Eric Ries describes this as ‘vanity matrix’, those numbers that are rolled out, but with a little digging are shown to bare very little information. The problem is that we need to be more creative about how we measure innovation. This often begins by defining what the problem is in the first place. Simply coming back to NAPLAN results, PISA rankings or progression points does not always suffice. To gain a deeper perspective we often need multiple points of data to draw a clearer picture of the problem at hand. 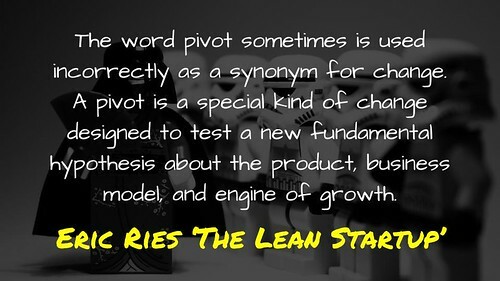 Whether it is zooming in, zooming out, changing customer, moving from an application to a platform, moving from a platform to an application, changing how value is captured or adjusting the channels used to deliver the product, a pivot is best understood as a significant change of tack. Eric Ries describes this as, “a change in strategy without a change in vision.” In education, this is about making those significant structural changes to support an improvement in learning. For example, Greg Miller provides different methods for reallocating time to support self-directed learning. While Corrie Barclay has shared how his school has used the flipped classroom model to improve student outcomes and engagement. Each of these changes involve a considerable change in resources and thinking. One of the challenges associated with innovation is the fear of risk and failure, especially when it comes to larger organisations. 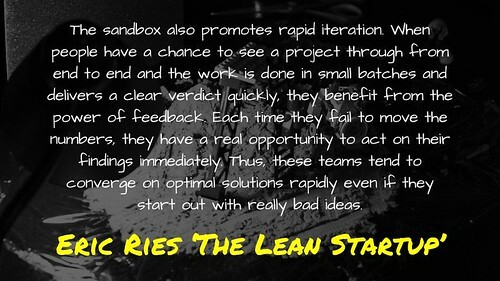 One answer is to sandbox such change, that is portioning off a part of the whole to focus on research and development. Once such changes have been appropriately refined and prototyped, they can then be taken out of the sandbox and added to the status quo. Adrian Camm describes this as running ‘dual operating systems‘. An example of this is idea of electives. Instead of doing more of the same, electives offer a prime opportunity to test and trial different practices to find out what works best. In Counting What Counts, Yong Zhao suggests that, “numbers don’t lie, but they can be used to endorse lies.” This says so much. Sometimes the worst thing that we do is find any way possible to provide a supposed story of success. This unwillingness to recognise the elephant (or elephants as Will Richardson would have it) in the room often leads to a failure to innovate based on the initial vision and hypothesis. The challenge is often developing a collaborative culture which recognises failure and confusion as an opportunity to feed forward, that is the potential to see where the next learning step is and act on it. Now maybe I am wrong. Maybe I am being too optimistic about the benefits of business to support learning. Maybe it is all just a part of the neo-liberalism ideal, whose roads all seem to lead to Pearson. 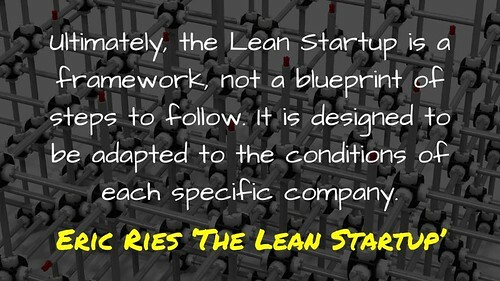 Can such principles be used to develop a system that encourages the creation of value as opposed to fostering growth? As always, thoughts and comments welcome. For more on Lean Startup, here is a collection of videos to get your going or else visit the website The Lean Startup. Also, check out Tim Kastelle’s Lead Startup series for further elaboration on the different concepts, as well as the Episode #o68 of the TER Podcast for a discussion of the merits of business in education. 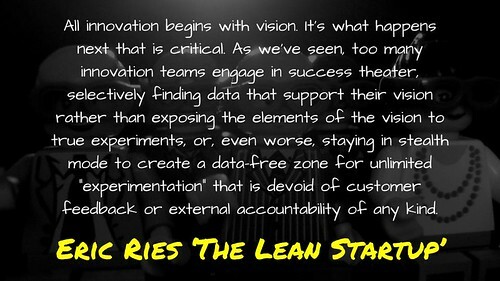 A Lean Education by Aaron Davis is licensed under a Creative Commons Attribution-ShareAlike 4.0 International License. A great post Aaron. Much of what you suggest and elaborate upon is counter cultural to the endemic understanding of education. You are suggesting a far more edgy approach to education, one which caters for students by listening to them and working with business in a way which prepares our students for the real world which awaits them. It will be great when mainstream schooling value prototyping more than NAPLAN. Thank you Greg for the comment. I must admit it is those like yourself who challenge my thinking with ‘what if’ questions that makes such posts a possibility. I just want to clear up, I think that sometimes schools need to think like a business. However, I am not vouching for the privatisation of public education for profit. Just as we may ask ‘What would X do in this situation?’ (What Would You Do?) Why can’t we stop and ask, what would a startup do in this situation? I think that we have a lot to learn from beyond the four walls that maybe we sometimes overlook. I wonder where metrics such as NAPLAN first had their life, would not surprise me if it we not in education? Not sure.